Vendor Spotlight- Jazmin Alford of Anyvent! Smart, funny and passionate were the first words that came to mind when I first met Jazmin Alford a couple of months ago. She came into the store to help a client find her dream dress, and I knew right away that this woman absolutely loves what she does. She provided the bride support, understanding and a lot of laughter; it was probably some of the most fun I’ve ever had during a consultation. When we first started making out a list of vendors to interview for our blog, hers was one of the first names to come to mind. Right away we found out we had a little more than our love for the wedding industry in common–we’re both originally big city girls (I hail from Los Angeles, while she’s a New Yorker), and we both said goodbye to our urban roots around two years ago. We agreed that the small town charm of Charlottesville was a welcome change after years of hustle and bustle in the city. When I asked what she loves the most about Charlottesville Jazmin said it’s the natural beauty–she loves seeing the mountains and hills through the open skyline, a sharp contrast to the skyscrapers she was once accustomed to. She also loves that everyone in Charlottesville is so friendly and welcoming–it didn’t take her long to feel like she was right at home. While in NYC Jazmin worked for a property management company, and it was there that she realized how much she loved event planning. She found herself planning corporate and residential events, and loved every minute of it. Upon moving to Charlottesville she decided to give in to her passion for event planning and she started her own business, Anyvent. When I asked what it was like owning her own business, she said that it was a lot of pressure but that she wouldn’t have it any other way. She loves calling the shots, the relationships she builds with her clients and other vendors, and she’s having a lot of fun. Jazmin gets to travel quite a bit, planning events around the midwest and east coast, but she’s starting to break a little further into the Charlottesville market and loves working with the wide array of venues and vendors. 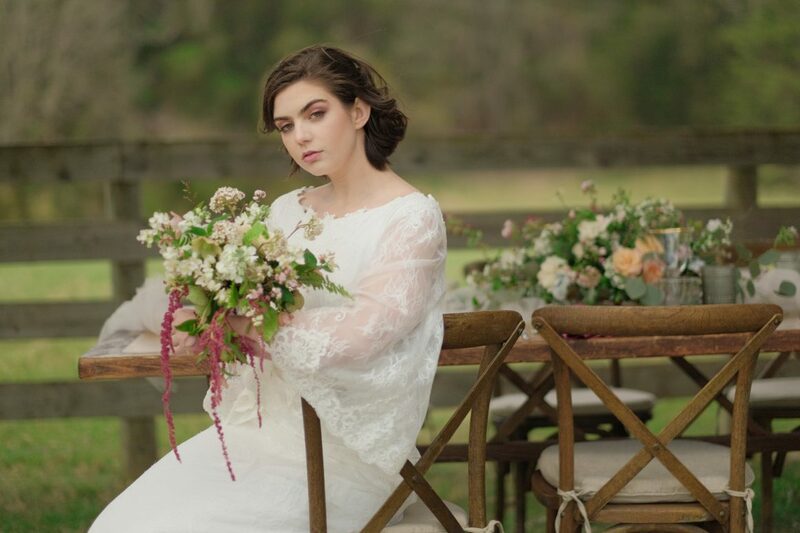 She offers both full service wedding planning and day of coordination, and she really can customize the event to be everything the bride dreams of. I asked her what a typical wedding day for her looks like, and she said that for an evening wedding her work starts at around 8am–she gets to the venue and makes sure the decor is just right, coordinates all of the other vendors, and makes sure the bridal party is exactly where they need to be throughout the day. She handles any last minute issues that come up on the wedding day so that the bride doesn’t have to–she told me about this one instance when she realized that the caterer didn’t provide napkins for a reception, so she had to come up with a solution at the last minute. In the end everything worked out great, and the bride had no idea there was ever a problem. When I asked Jazmin what advice she has for brides-to-be, she said to get a planner to either help put together your whole event, or at least provide day-of-coordination. Couples often underestimate how helpful a planner can be, and especially don’t realize how much money getting a planner can save you in the long run with their connections to other vendors in the industry. After listening to Jazmin describe all the work she puts into planning a couple’s big day, I begin to see how having an event planner like her on your side is akin to having a fairy godmother plan your wedding for you–all your dreams really can come true! Learn more about Jazmin and Anyvents by checking out her website at www.anyvent4you.com. Erica and the Top Knot Pups! When I first met Erica she was a bubbly bride-to-be. As I sit down to chat with her today she is an official Sealed With A Kiss bride and trusted Charlottesville wedding professional! Erica currently owns Top Knot Studio on Charlottesville’s Downtown Mall, and let me tell you, she is a stylist extraordinaire! She certainly found her niche even though it wasn’t always her lifelong dream to own a hair studio. At sixteen she was known by her family and friends as your go-to girl when you wanted extra-special hair styling. Years down the road her once hobby developed into a passion when she attended hair styling school in MD where she grew up. Even after finishing her training she didn’t find herself in the hair industry just yet. She spent a couple of years working in marketing and one fateful day during her lunch break answered an ad for a salon on Capitol Hill. She interviewed and was hired on the spot as Salon Manager. The Salon she worked for, part of the Bubbles chain, expanded to Barracks Road in Charlottesville as Salon Cielo. She relocated to Charlottesville where she managed the salon for 4 years. It was during this time that she realized she loved Charlottesville and wanted to make it her home. She continued to work at other salons and then decided she truly wanted to own her own studio and opened Top Knot in 2011. Erica works with brides-to-be often and has great words of advice for marriage as well as wedding day hair. She advises brides to “know what’s important” on their big day and I can’t agree more. We went on to discuss that it’s not the little things that matter – it’s about living in the moment on that day and looking forward to all the moments in the future with your new husband. In regards to wedding day hair she says that if your budget allows, book your stylist for the entirety of the day. She says many brides often can’t choose between one or two styles. Having your stylist for the day allows her to change and touch up your look and also relieves a lot of stress. We also chatted about the idea of “statement hair” – is this already a thing? If not, it should be! Can you imagine having the best of both worlds – elegant ceremony hair and then rockin’ reception hair? I think we’re onto something. Erica went on to tell a story about a recent bride. This particular bride invited Erica to stay and enjoy the wedding even after her job was complete. She gushed that the bride was incredibly sweet, fun, and made a great impression on her wedding vendors as she really made everyone feel like family. As wedding professionals, it’s our job to provide our customers with the best product or service possible, but it never feels like a job when your customer treats you as part of their family. Our customers are truly part of ours too. They impact our lives and provide us with stories and photos we’ll never forget. Lastly, I asked Erica what makes her business unique. A slight pause later she answers “Me!” and I shouted “YES!”. She went on to clarify that having her is like having a new friend who cares enough to do anything so you look & feel the MOST beautiful on your special day. Erica has such a glowing personality and friendly, professional demeanor. And not to mention, when you visit her salon you also get to visit with her two chihuahua’s Tbeau and Mamacita! Erica’s story and qualities definitely put her and Top Knot at the top of our most preferred vendors! It’s not everyday that a trip to the grocery store leads to a life-changing event. But one particular grocery trip changed everything for Kandie Stanton. While perusing the store, she heard a voice call her name, as she turned around she was surprised to see a classmate from high school that she had not seen in over seven years. They chatted for a while, stood in the checkout line together, finished their conversation and she went on her way. But he wasn’t going to let her go that easy. He asked the cashier if he should get her number – an obvious yes, a quick jog to the parking lot, a phone number later, and the rest is history. John and Kandie started dating shortly after their reconnection and about a year later she found herself realizing that he was going to be the man she would one day marry. She loved how much alike they were. Their minds and personalities blended perfectly and she knew it was meant to be. Just like their first interaction in the grocery store a year and a half earlier, the proposal caught her off guard. They share birthdays a day apart from each other and to celebrate her birthday they planned to spend the evening relaxing and having dinner at a local restaurant. After they finished their meals she got up to go to the restroom and came back to find the waitress awkwardly standing by their table. She sat back down and John asked if she wanted anything for dessert. She refused at first but he strongly insisted they have dessert. A few minutes later the waitress brought the dessert to their table and Kandie eyed it with some confusion. There was something in their dessert…and it looked like a piece of jewelry. She insisted it must have been meant for someone else and tried to send it back. Then she looked up to see him down on one knee, proposing. They began planning a spring wedding which led to her “by chance” visit to our store. While walking the Downtown Mall in Charlottesville, Kandie noticed a dress in our window that caught her eye. Though she loved it when she first tried it, she didn’t say yes just yet. She tried it two more times before deciding it was the one. She opted to add an additional foot of length to the train, and what a great decision that was! When the dress arrived and Kandie put on her actual dress for the first time we were all in awe. At her final fitting with her parents everyone was all smiles, it was perfect. Kandie was always so calm and collected at each of her appointments – often a rarity when you’re planning a wedding. I asked her what advice she had for brides-to-be. She simply stated “take your time and enjoy the moment. All that matters is that at the end of the day you’re married”. Such a simple concept but so easy to forget while in the midst of planning a wedding. Thank you again, Kandie, for sharing your love story with us! We wish you and John many years of happiness! SWAK bride Brynne and her husband Jonathan had what many would call a whirlwind romance–they met during the summer of 2014 and married in January 2015. When I asked Brynne to tell me her love story, she said it was essentially love at first sight. She’s a social worker in a psychiatric facility, and Jonathan was just hired as a security guard when their paths first crossed. She often worked with her office door open, and Jonathan would come in uninvited and start up a conversation. Brynne says there was an instant connection, but at the time she wasn’t in a hurry to jump into a relationship, so she didn’t respond the first couple of times he gave her his phone number. She couldn’t resist him for long though, and when they finally went out on their first date she said they both knew they had found ‘the one. Once they started dating there was no separating the two of them, and they were engaged by November. Brynne says there was no point in waiting to get married, as they both knew they had found their soulmate. They considered eloping, but in the end decided that they wanted to be surrounded by their family and friends when they made their vows. I asked her what it was like planning the wedding in only a month, a process that takes most other couples a year or more to plan out, and she said it was rather easy. They were focused on being together, not on the details of the event, and in the end everything fell into place on its own. They were married in a lovely ceremony on January 3, 2015. When I asked Brynne what advice she would give to brides-to-be, she said she would tell them not to get hung up on the details. Everyone worries about making sure every aspect of the wedding is perfect, but she says down the road you’re not going to remember what your wedding colors were or what flowers you chose for the centerpieces; you’re going to remember getting married to the love of your life. Congratulations again, Brynne and Jonathan!